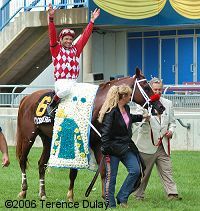 Jockey Todd Kabel tosses flower petals in the air to celebrate his win aboard Sky Conqueror. Woodbine commemorated its 50th anniversary with the inaugural running of the $700,000 Northern Dancer Breeders' Cup Turf (G2). Unfortunately, heavy rains earlier in the afternoon washed out the temporary inner dirt track, putting a damper on the festivities with the cancellation of all the dirt track races after Race 2. However, the two turf stakes races were run as scheduled, including the main event. A field of seven went to post in the Northern Dancer, a 1 1/2 mile trip over the E.P. Taylor Turf Course, with the Christophe Clement trainee Revved Up sent off as the 8-5 favorite over 3-1 Porfido, both horses having shipped in from New York. Porfido was to have been ridden by Garrett Gomez but due to an incident involving lost luggage the night before the race, Kent Desormeaux was given the assignment aboard the Bobby Frankel trainee. 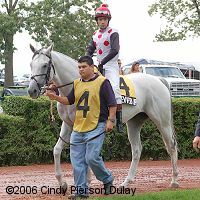 Leading the local contingent was 4-1 Jambalaya, winner of the Singspiel Stakes last time out. 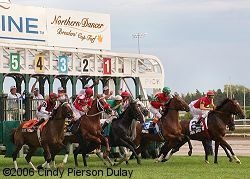 The horses break from the gate for the inaugural Northern Dancer Breeders' Cup Turf. When the starting gate opened, 14-1 Last Answer, the longest shot on the board, went right to the front under jockey Emile Ramsammy, and he was given an uncontested lead through slow fractions of 25.50, 50.94, 1:16.33, and 1:42.38 over the soft going, while leading by as many as eight lengths down the backstretch. 12-1 Shoal Water sat in second place, well back of the pacesetter and a length ahead of the closely packed bunch behind him. Rounding the far turn, the rest of the field began to close the gap on the pacesetter, but Last Answer still was 2 1/2 lengths clear at the top of the stretch, having gone 1 1/4 miles in an easy 2:08.16. Last Answer held a 2 length lead at the 1/8 pole, but he was already tiring from the soft conditions while 9-2 fourth choice Sky Conqueror, who had raced back in 6th early, was closing on the outside with every stride under the whip of jockey Todd Kabel. 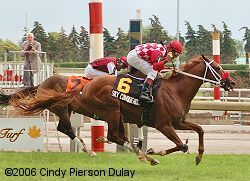 In the final strides, Sky Conqueror wore down Last Answer to prevail by just 1/2 a length in a very slow time of 2:34.36 for the twelve-furlong trip. It was a long 2 3/4 length back to Jambalaya, who was in third the whole way. Favored Revved Up raced well off the pace and saved ground on both turns but showed no rally at the end, finishing a disappointing sixth beaten 15 1/4 lengths, half a length behind second choice Porfido. Sky Conqueror poses in the winner's circle with trainer Darwin Banach at his flank. Banach said, "There are always concerns when you try something new, it was his first time going a mile and a half. He did something he hasn't done. In his training he showed he wanted to go far, so we expected him to get the distance. It is a very nice progression, he hasn't let us down so far. We picked out our spots and we will probably stick with them, but we'll talk to Mr. Sorokolit (owner). We'll probably stick to our game plan." 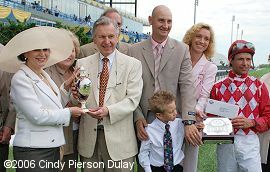 Noreen Taylor, vice-president of Windfields Farm which raced and stood Northern Dancer at stud, presents the trophy to owner William Sorokolit. Sorokolit said, "It's very, very special. It's once in a lifetime. I was concerned about the horse that was way out on the lead (Last Answer) there. I thought he might just steal it. Todd did a marvelous job of catching him." 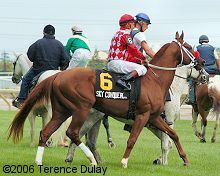 Sky Conqueror in the post parade. 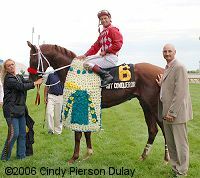 Winning jockey Todd Kabel said, "I thought somebody would go with (Last Answer) and once he got away on his own, it is pretty easy for a horse to get away on you. I'm not the one to spot any horse that much ground in a race, especially on this turf course, but my horse came up big. Once we straightened up by the backside for a stretch it was really soft, other than that, I have to say, the turf was really forgiving, most of it. I was really concerned, I had to make up a lot of ground and we never got to give this horse a nice breather in the turn. I thought (Ramsammy) gave his horse a tremendous ride. I think (Sky Conqueror) is a very nice horse. He is coming around, he is well in hand. They've done a tremendous job back in the barn." Second place finisher and pacesetter Last Answer tries to hold on at the end, but just can't do it. His jockey Emile Ramsammy said, "'Almost' is always a mile away. Mike (Keogh, trainer) left me alone to ride my own race and I told him I had a chance to send him a little early. Once I hit the first turn everybody took hold, and I didn't want to be 7 wide so I put him on the lead. At about a mile and a quarter I said to myself 'I'm not looking back.' He's a little bit aggressive on the bridle all the way, he hung on well, he ran well, he was just second best today. Sorry I didn't get there." 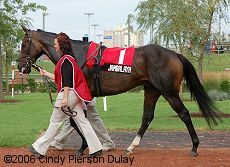 Third place finisher Jambalaya in the paddock before the race. Sixth place finisher and beaten favorite Revved Up in the paddock. His jockey Brice Blanc said, "He just didn't handle the track, didn't fire. He had a little kick at the top the stretch but that's it." 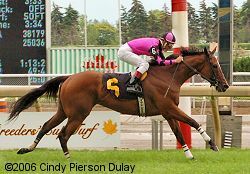 The undercard event on Northern Dancer day was the $75,000 Ontario Jockey Club Stakes, a 7-furlong sprint on the turf for older horses foaled in Ontario. Only 5 went to the post here, with Sophia's Prince sent off as the even-money favorite. However, 9-2 fourth choice Millfleet went straight to the front and set a strong reserved pace of 25.04 and 49.93 down the backstretch, then found another gear at the top of the stretch to draw 2 1/2 lengths clear with a furlong to go. Millfleet easily held off 7-2 third choice Raw Power late to prevail by 1 1/2 lengths at the line, in a time of 1:25.89 over the soft course. It was 2 lengths back to 5-2 Awesome Action in third, while Sophia's Prince was fourth. 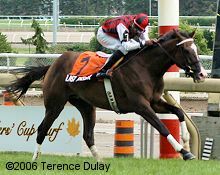 The victory was Millfleet's fifth win from 30 starts and his second stakes score over the turf. While Polytrack is being installed on Woodbine's main track, dirt races are run over a temporary inner track constructed over the existing 7 furlong stone dust harness track. However, due to this design any significant rainfall can wash out the cushion making the surface unsafe for racing. 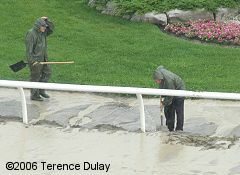 A steady rain through the first and second races rendered the track unsafe, and the jockeys voted not to ride the remaining dirt races on the card, despite the best efforts of track maintenance workers to shovel dirt back onto the track. Woodbine VP of Thoroughbred racing Chris Evans said, "My request was to keep to the two turf races on because the turf track, although wet, is not unsafe. We almost never take stakes races off the turf. We thought with the people here and the horses that had shipped in, the best alternate scenario was to at least run these turf stakes." On the positive side, Evans mentioned that the Polytrack installation is ahead of schedule, with the first races to be run over it on August 23.